Bitcoin (BTC) is range bound Saturday. The number one virtual currency is stuck in the range after a brief recovery from the support at $6,100. This slight upward move was important to investors who were in expectation of a break towards $7,000 level. Bitcoin traded on a consolidation phase in the past weeks leading traders to be optimistic that a bullish break was imminent. Nevertheless, the much-anticipated breakout turned out to be a breakdown as the bears dragged the price down, beating the bulls mercilessly. As of 17:45 GMT, Bitcoin is trading at $6,323 after a slight recovery from the above-mentioned support at $6,100. Apart from the price fluctuations, there are other things that have happened that shows that Bitcoin price could rally. Bitcoin price movements are more extreme than in stocks and definitely than those in fiat currencies. We also see flash crash occasionally. More so, we have seen lower volatility than it used to be. Although this may be uninteresting for investors looking for immediate gains, low volatility plays a role in making cryptocurrencies more attractive. If a currency experiences high volatility, it makes it unprofitable for daily transactions. For instance, it is worthless to purchase any product if the value changes so rapidly. Hence, the price of Bitcoin is set to rise as it is now been widely accepted as a means of payment. Even though the increase in value seems to be slow, it will be more consistent with a more stable exchange rate. According to Google Trends, the search for Bitcoin has dropped to levels that were last seen around 18 months ago. 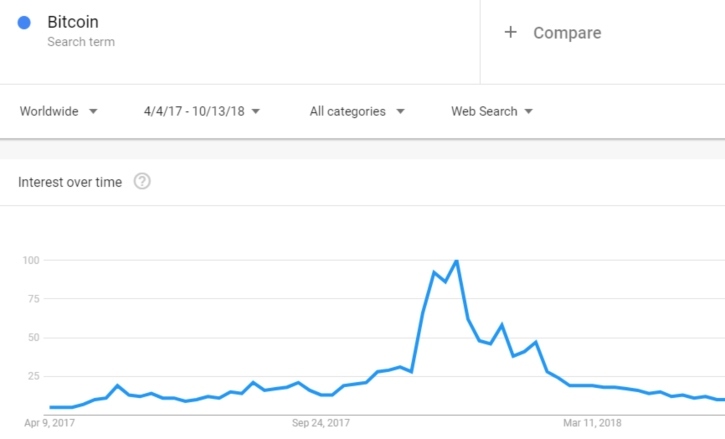 The data show that it is far off the peak seen around the turn of the year. However, this does not indicate the reduced inflow of money in the number one virtual currency, but it is rather a good sign. When you look at it from a different perspective, prices are far above that level, despite volatility returning to the lowest levels since April 2017. Despite the rise and fall in Bitcoin prices, the digital currency is stronger than it was back then as it has gained the support of heavyweights in the crypto sphere but less support from the larger public. Hence, prices could surge once the broader audience gets back in. For the broader public to get back into trading cryptocurrencies, access to digital coins needs to be facilitated. A lot of mainstream investors find it complicating with the process of creating a wallet, signing up to the exchange and worrying about security. However, it will undoubtedly be helpful to invest in cryptocurrencies via a well established financial and accessible instrument such as an Exchange Traded Fund (ETF). Nevertheless, the US Securities and Exchange Commission (SEC) are yet to give their blessing to the nine Bitcoin ETF applications. Back in September, the SEC announced that it has begun proceedings to decide whether to approve a proposed Bitcoin exchange-traded fund. Although no deadline has been set yet for the Bitcoin ETF approval, companies big and small are relentless in their effort to gain such approval. SEC’s indecision on Bitcoin ETF will break eventually and hopefully, they will give their first seal of approval. However, a Bitcoin ETF will most likely be made available to retail investors only as Bitcoin and not futures on the digital coin. The price of Bitcoin rallied just around the time when the Chicago Mercantile Exchange‘s (CME) futures on Bitcoin were launched. The move came after the Commodity Futures Trading Commission (CFTC) said it will allow the world’s largest futures exchange and its competitor, the Cboe Futures Exchange, to launch Bitcoin contracts. Months have passed since the all-important firm introduced Bitcoin futures and so far, the Market is performing smoothly, which is an indication that Bitcoin is maturing. At the time of writing, Bitcoin market capitalization was around $108 billion. It is worth more than five times the value of Ethereum which is $20 billion and Ripple standing at $16 billion. 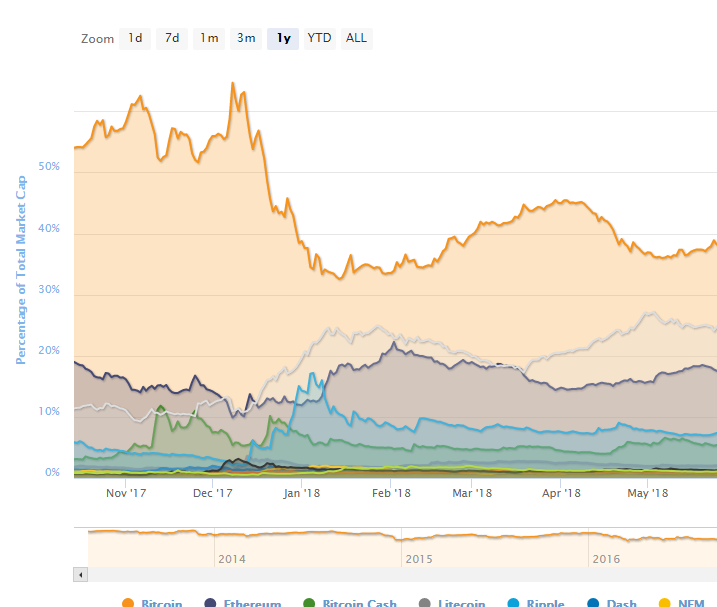 Moreover, Bitcoin dominance is currently above 53.9% after long months in which the value of Bitcoin was lower than the accumulated value of all its competitors. This places the greatest of cryptocurrencies above all the rest, ending doubts about which digital coin is ready for a rally.